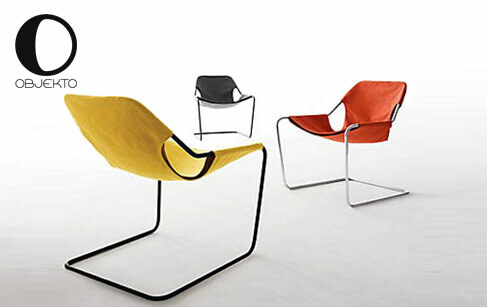 A foothold between Europe and Brazil, Objekto offers alternative approaches to contemporary design. Under the inspired hands of Brazilian designers, folklore, constructivist and functionalist concepts are combined to give rise to sophisticated and innovative furniture. The group’s respect of tradition is naturally joined by creative freedom to break with orthodoxy. This is achieved without losing the imagination or poetry of the form. "Coração partido" as the Brazilians say. Benoît Halbronn, Matthieu Halbronn and Guillaume Leman, animated by a common passion for this continent country and the design, are at the origin of Objekto. A company, two offices: one in Marseille, the other in São Paulo. Their vocation: to promote the Brazilian design and designers. Their focus: to represent, edit and distribute in Europe and US a group of Brazilian designers revealing the contemporary creations of their country (furniture, luminaries, objects). Their network: retailers of furniture and contemporary luminaries and art galleries. Leitmotiv : quality, innovative character and accessibility of creations they distribute.